Single cartridges are available for collectors , see in below related items. 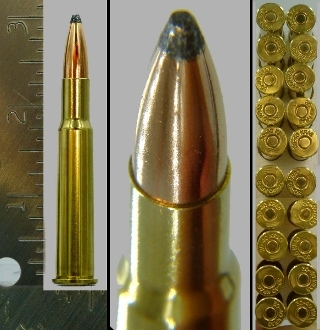 History of .30 Army, aka, 30-40 Krag Cartridge: The 30 Army is a small -bore rimmed cartridge introduced into the U.S. Military in 1892 for the (Krag-Jorgensen) Bolt Action Rifle which replaced the 45-70 Cartridge. The nick name 30-40 Krag was given to the .30 Army as it was used in the Krag rifle and was loaded 40 grains of smokeless powder, and was a 30 caliber, so the nick name 30-40 Krag stuck. It was replaced in 1903 by the 30-03 or 1903 Government, before the 30-06 replace the 30-03 in 1906. It is still used today and a good hunting rifle cartridge.